QUANTAMIS NAVARATHNA and PM BOOKMITE Play Back-to-Back Again 24 January – Ce Soir Arts – Be inspired tonight! We had such a wonderful time with these two excellent musicians last week, that we decided to have them back again in the same time slots. While each is distinctive and unique in approach and style, they both make beautiful, richly toned music – and both are charming and a pleasure to know. Quantamis Navarathna will open the evening with covers and original songs that range from love ballads to tales of magic and wonder. We’ve had comment about his “Tossing Away the Hourglass” by one young man who told us that it is now he and his beloved’s favourite song. We’re not at all surprised. Quantamis‘ music does touch the heart, and his flawless guitar-playing provides a lovely ground for every song in his romantic repertoire. His artistic versatility makes his set a lovely adventure as he shares a most pleasing blend of acoustic folk, soft rock, alternative, Spanish classical and Renaissnce romance. That hint of Texas charm infuses the whole with a certain…je ne sais quoi that is very pleasing indeed. 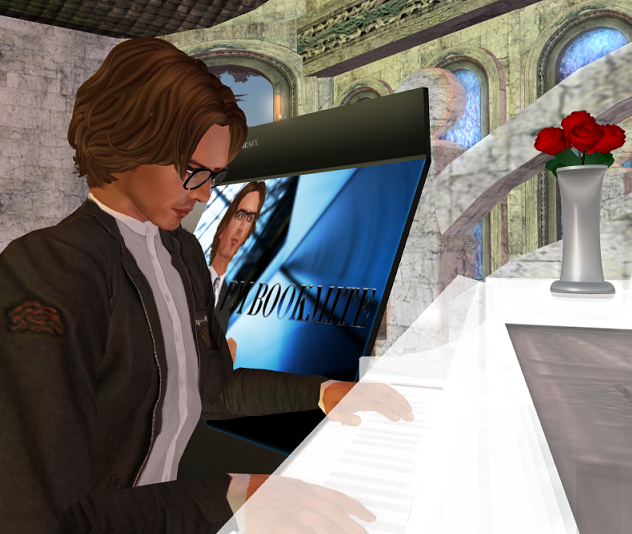 Next, PM Bookmite (Phillip Mitchell in that “other life”) will fill the venue with melodic piano and that soft but strong voice that makes you want to just sit down and listen. A seasoned singer-songwriter influenced by a broad range of artists including Tom Waits, Billy Joel, Gabe Dixon and Ben Folds, PM offers covers and originals that are sweet, warm and memorable. Each carries a theme that can be woven into the fabric of his set, making a luxurious tapestry of love, loss and the journey that is life. Always reflective and moving, PM‘s music is ear candy at its sweetest, and we know you will be glad you we here to enjoy it. Please join us; you will be most welcome! Please note: SecondLife is a registered trademark of Linden Labs. We are not formally affiliated with Linden Labs and no infringement of their rights is intended. Indeed, we are happy residents of SL and invite you to join us, if you’re not yet a resident. Visit http://secondlife.com to register and take on an avatar for free. Next 25 January – a “red-letter day” at Ce Soir! FIVE SHOWS!